The school holidays are now drawing to a close - Am I the only one who finds they get shorter with each passing year? This year is going to be really different for me, as I am now a senior! New classes, new people, new uniform, new year, new pencil case. The pencil cases in the stores I visited were either not very attractive, overpriced or both, so I decided to make my own! 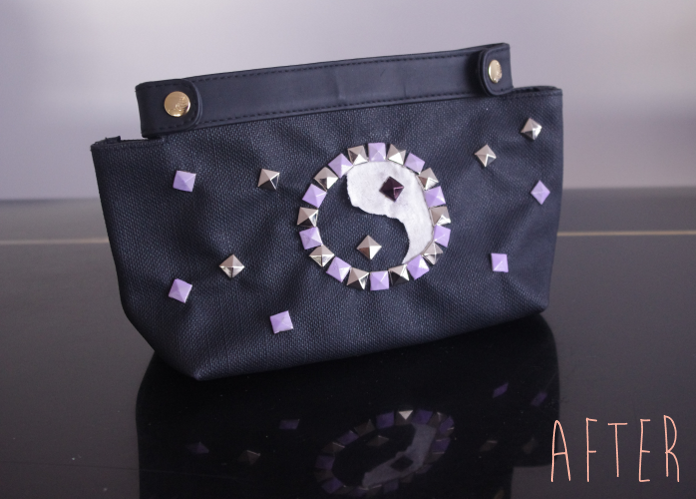 I used pyramid studs and a Yin Yang design but you can definitely change it up! Paint/Nail Polish ~ I painted some of my studs with lilac nail polish to make it more feminine. 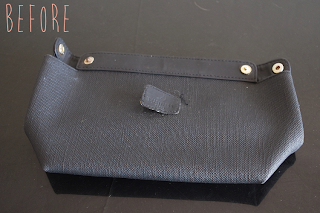 This is actually such a simple DIY (I wouldn't have been able to do it otherwise haha). Basically, draw your design on some fabric, cut it out, glue/sew it to your bag (optional)...Okay now for something a bit trickier, start studding around your design BUT make sure you are studding through some of the fabric as well as the bag, this is what attaches it to the bag! You don't have to stud all 4 prongs into the fabric, although this will make it more secure, personally I only out 1 prong through the fabric. If your bag has any unwanted logos, you may want to unstitch/cover them. Voila! Add some more decorations if you wish and you are finished. I hope you enjoyed my first DIY! Side note: I was originally going to buy a yin yang applique off eBay but shipping would have taken too long (being the organised person that I am, I left this to a few days before the start of school) also the size of the applique may have been off and this saved me a few bucks so why not!